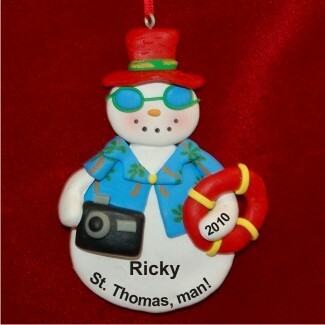 If you've escaped the snow and cold to enjoy sun, sand and sea, commemorate the trip with the winter holiday snowman personalized Christmas ornament ready for total relaxation. It's fun to hang it on the tree to anticipate an upcoming trip too! We add your custom details to each of these travel & beach ornaments that are entirely handcrafted right down to the details on the Hawaiian shirt. The winter holiday snowman Christmas ornament personalized for you or a friend will bring instant warmth when it arrives in our custom velvet drawstring pouch. There's a matching one for her too!